Abu Hafs al Tunisi. Image from the SITE Intelligence Group. An Internet jihadist has confirmed that a Tunisian was killed during a recent US drone strike in Al Baydah province in Yemen. 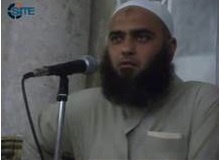 A message posted on the al Qaeda-linked Shumukh al Islam website stated that Muhammad bin Muhammad, a Tunisian whose nom de guerre is Abu Hafs al Tunisi, “was martyred days ago … in the area of al Manasih in Al Baydah province.” The statement was published on Aug. 15 and obtained and translated by the SITE Intelligence Group. While the statement did not say that al Tunisi was killed in a drone strike, Yemeni officials reported that “Abu Hafsah al Tounisi” was killed in the Aug. 8 strike in Al Baydah. Also killed in the strike were two Egyptians, a Saudi, a Bahraini, a Yemeni, and a wanted bombmaker known as Abdullah Awad al Masri a.k.a. Abou Osama al Maribi [see LWJ report, US kills AQAP bombmaker, 9 fighters in pair of strikes in Yemen]. According to the martyrdom statement, al Tunisi was from the city of Benzert al Jala’a. He “joined the convoy of mujahideen in the Yemen of victory after he spent years in the prisons of the runaway tyrant Zine El Abidine Ben Ali,” the former president of Tunisia who was ousted last year during a national uprising. It is unclear why al Tunisi had been imprisoned or when he was released. His martyrdom statement was accompanied by two videoclips of him in Tunisia, “one showing him speaking during a demonstration in Bizerte, Tunisia, and the other showing him giving a lecture at a mosque in the same city,” according to SITE. “In the speech at the demonstration, Muhammad prayed that God liberate Palestine, make Muslim youth follow the religion, and remove those who ‘conspire’ against Islam,” SITE reported. Foreign fighters have been killed in Yemen in the past. This year, two Jordanians, including Abu Hammam, the nephew of slain al Qaeda in Iraq leader Abu Musab al Zarqawi, were killed in drone strikes. Last year, a US drone strike killed Anwar al Awlaki, an American citizen who served as a top AQAP ideologue and planner for external operations against the US. The US has been targeting al Qaeda in the Arabian Peninsula using unmanned drones. The strikes have intensified this year as the Yemeni military went on the offensive against AQAP in their strongholds of Abyan and Shabwa provinces. Three senior AQAP operatives have been killed in the 28 strikes in Yemen so far this year.